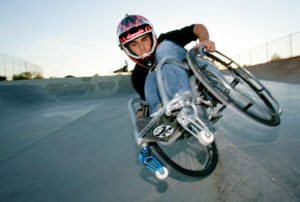 Aaron “Wheelz” Fotheringham is a 27-year-old (8 November 1991) elite wheelchair motocross (WCMX) athlete from Las Vegas, Nevada, who was born with Spina Bifida, a birth defect of the spinal cord, which resulted in him having no use of his legs. He is an extreme wheelchair athlete who performs tricks adapted from skateboarding and BMX. He used crutches early on but has been wheelchair-bound since the age of eight. Aaron is the third of six children, all adopted. He is also a member of The Church of Jesus Christ of Latter-day Saints (often mistakenly referred to as the “Mormon Church”). He has never allowed his disability to get in the way of being able to do the things that he wants to do. Even as a baby and young child, he did anything anyone else his age could do, with the difference being that he had to figure out ways to make things work for him. As a baby, he did almost everything right on schedule – rolled over, sat up, and even crawled (on hands and stomach, no leg action). He started with a walker and then crutches which he mastered quickly and at the age of 4, he would blast down the hall with a Superman cape on, believing that he could fly. At the age of 8, being encouraged by his older brother Brian, a BMXer, Aaron started riding at skateparks. The first time that he tried he fell hard, but not being a quitter because something wasn’t easy, he was soon back up and trying again and from then on he was hooked. Early in his career, Aaron entered and won a few BMX Freestyle competitions, including the legendary 2005 Vegas AmJam BMX Finals. However, earning those accolades only proved to be secondary to the joy that he got from riding and hanging out with his friends at skateparks in Las Vegas. Over the years, Aaron has challenged himself to take the lead in creating even more difficult stunts. In 2005, he perfected a mid-air 180-degree turn. On 13 July 2006, he landed the first wheelchair backflip. 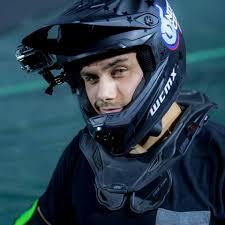 On 26 August 2010, at Camp Woodward in Woodward, Pennsylvania, he landed the first-ever double backflip. Since then he has gone on to perform live on tour with Nitro Circus. But the action and adventures do not stop there. On 9 February 2011, in New Zealand, Aaron landed his first front flip, and on 25 August 2012, he amazed onlookers in Brazil by jumping and successfully landing a 50-ft gap off the Mega Ramp in his chair. He is also a four-time winner of the WCMX World Championships and recently executed the first Wheelchair Flair/backflip 180. After posting the first-ever backflip on social media, life has changed for Aaron. He has had the opportunities to travel globally, performing and speaking. He has also attended summer camps for disabled children as a coach/mentor. And he has been featured in magazines, newspapers, and sports television, and he receives and responds to emails from around the world. Aaron “Wheelz” Fotheringham believes anyone can overcome challenges when one has faith, hope, and the Atonement of Jesus Christ.